Megan Griffiths has been deeply embedded in motion picture production for over a decade, yet after directing her first low-budget feature upon graduating from college (First Aid For Choking, 2003), she fell into a groove working as a producer and First Assistant Director on features in and around her adopted hometown of Seattle (Zoo, The Immaculate Conception of Little Dizzle, The Catechism Cataclysm, Your Sister’s Sister). After struggling for years to get her second feature off the ground, with the help of some very devoted producers, she finally made it happen. The Off Hours world premiered at the 2011 Sundance Film Festival and went on to receive a Spirit Award nomination (for Ben Kasulke’s cinematography). Since then, Griffiths has managed to return to the director’s chair while exploring new genres and terrains. 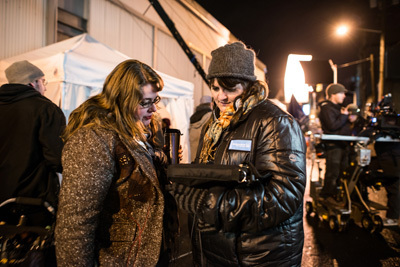 For anyone who wants to be a director yet knows how hard it is to sustain a career without becoming pigeonholed, Megan Griffiths’ trajectory is something to admire and aspire to. In the days leading up to the release of her latest film, the star-studded naturalistic comedy Lucky Them, I hopped on the phone with Griffiths to discuss her path of the recent few years. Hammer to Nail: I’d love to break down how you got to where you are right now. Would you say that The Off Hours getting into Sundance was the real starting point for you as a director versus being a producer or an AD? Megan Griffiths: Definitely The Off Hours. I made a feature before that but it was like eight years before that, and then I spent all that time basically both trying to get Off Hours made and then also working on a bunch of other stuff. I was pretty firmly in the assistant director chair until Off Hours and that’s mostly gotten me out of that chair. After shooting Off Hours I did AD Your Sister’s Sister and The Catechism Cataclysm, but I was also a producer on both of those things. H2N: There are obviously many talented folks in our world who AD and set dress and PA and grip and whatever else, but deep down they have their own movie they want to direct. What finally got you over the hump to actually make The Off Hours after so many years of trying? I should also add to that part of the reason we did it too is that so many crew members kept telling me they would work on it for free, who I’d worked with as an AD. I had all these relationships with crew, and people were so encouraging that that was a big part of it. Working as a crew member myself, I had a lot of goodwill in my corner. H2N: Regarding Eden, I’m pretty sure that project happened because of The Off Hours, which is pretty cool because it’s not like there’s an obvious link between those two movies in any way at all, or am I totally off base here? MG: Okay, so The Off Hours was at Sundance, and I got the script for Eden when I was at the Salt Lake City airport coming back from Sundance. So it was really immediate. It was this guy Colin Plank who worked on The Off Hours who had, unbeknownst to me, the whole time he’d worked on my film, had been sort of scouting me, I guess. He had some money for the film and ended up raising more. I wrote a new draft of it. I came on as a writer first. I was like, “Why don’t I write a version of the film I would be really excited about making and if you wanna do that one then we’ll go off and make that movie.” I was also trying to scale it back because he didn’t have enough money to do what the original script was aiming for, so I sent him my draft and he was really on board with all the changes and excited about it, so then I came on as a director. H2N: What was his role on The Off Hours? MG: He helped us with locations. He came into the office and was basically offering to invest in exchange for a producer credit, but we weren’t open to the idea of anyone else getting a producer credit because our three producers had been on the film for so long. So we said no thank you to that but he said, “Well how can I help? I’ll just volunteer.” Our location manager was part-time, so he stepped up and filled out the other part of that job, which was much needed, so it was great that he did it. H2N: Talk more about the transition from agreeing to do a rewrite and agreeing to direct it. Were they begging you or had you fallen in love with the material to the point where you pushed hard for it yourself? MG: Well, he asked me to direct. I was the person who proposed being a screenwriter first because I wanted to make sure we were on the same page. I’d seen a lot of people—I know you know a lot of people in this category too—who have gone into a project where they were not on page with the producers and they’re trying to make different movies and it just always results in a horrible situation. MG: I was trying with all my might to avoid that situation. I’d rather not do the film than do the version I don’t like. But [Eden] ended up working out pretty well. I would say more people should do it but my agents keep telling me no one should do that because there’s this potential for you to rewrite a script that ends up being given to someone else. H2N: It’s interesting you said the “a” word because I want to ask about your agent’s role in this trajectory. I had actually thought Eden had sprung from that world but it clearly didn’t. MG: I didn’t get an agent out of Off Hours. I had a couple meetings but everyone kept telling me that nobody watches drama. [both laugh] So I had a problem getting an agent! I actually went to LA right before SXSW when Eden premiered, and tried to take meetings with managers and agents but couldn’t get a meeting to save my life. And then I went back right after SXSW, having just received the Audience Award, and it was a different world. I took all sorts of meetings and that’s when I got my reps.
H2N: Well, yeah, but Eden’s not a comedy! MG: It’s not. It’s not a straight drama, though, either. I think people were excited about the fact that there were some thriller type elements in it. For whatever reason—I do think the Audience Award helped quite a bit—but just in general having something not quite so small like The Off Hours. H2N: You can talk as freely as you’d like about this stuff, but Eden took a long while to come out. I know that a long turnaround is commonplace but I guess I’m mostly wondering how long after SXSW did you know that a deal was in place and you were going to be getting a release? MG: I don’t think the deal was signed on that movie until maybe five months after SXSW. It was a tough sell. It’s a weird movie that way because people who watch it seem to respond well to it. It was well received critically and we actually got a few audience awards, which kept surprising me because it’s such a dark film. It seemed to me that people were happy they saw it after they’d watched it, but getting people to the theater to see a movie about human trafficking is a tough proposition. I think it was really scary to distributors because no movie about this subject has really ever done well except Taken, and we didn’t exactly have the same approach as Taken! [both laugh] I just feel like people were really freaked out by the idea, but once they did get it, I think they found it challenging and maybe didn’t work outside the box enough to actually get people out to see it. I think it’s just the nature of the film. I’m proud of it and I’m happy it did as much as it did, but I feel like there was an opportunity there for us to do more and we’re all kinda bummed out by the fact that it didn’t. MG: I’m as guilty as anyone of keeping things sitting on my Netflix queue that are not “easy” views, and I’m sure Eden is that movie for a ton of people. [both laugh] A few people have told me that. “It took a while for me to watch it but I finally did and I’m so happy I did.” It’s there, people can discover it! H2N: Okay, so you’re finished with Eden and say to yourself, “Okay, I need a new project. I’m not an AD anymore, I’m a director.” How do you get from Eden to the next one? MG: That’s when I got my agent, so I did the rounds and had general meetings in LA, but none of those led anywhere initially. At that point, I definitely didn’t feel like I was looking for AD jobs. I was trying to stay in the director’s chair. I guess it was right after SXSW, after I got my agent, I was hanging out at SIFF with Colin Trevorrow [director of Safety Not Guaranteed]. He and I were just chatting about upcoming projects and he said, “Oh, you know what, I’ve been talking to this producer who is doing this Paul Newman/Joanne Woodward film called Lucky Them and I feel like you’d be really good for it. She was asking for directors, would you mind if I sent you the script?” So that one came through a friend and not my agent. I just read the script and bonded with the producer Emily [Wachtel]. She’d been working on the movie at that point for like a decade at that point, and I told her that I had worked on a film for a really long time myself—The Off Hours—and I couldn’t imagine giving it over at that point, so I was grateful that she would even consider trusting me with this decade’s worth of her life. And I think she liked hearing that and that’s what sealed the deal on that film. We worked together to move it from New York to Seattle, because it wasn’t originally Seattle. H2N: That’s a massive change, though, so right away it seems like for her to even consider that is showing a huge act of trust on her part. Was that you pitching it because of your comfort zone and your tight crew, or was it creative as well because obviously the Pacific Northwest music scene is so historically significant? MG: Basically that was the conversation. On the very first phone call, she told me they had already started talking about not shooting it in New York because they just didn’t have the kind of budget to make it there. They considered Nashville and Seattle and were looking at other cities and I said, “Come out to Seattle, I’ll introduce you to my team, you can see some of the places where I’d want to shoot.” And she and couple of the other producers—Amy Hobby and Adam Gibbs—came to Seattle and I showed them around and introduced them to people like Lacey. Just because it’s such a great group of people, and they had seen Safety Not Guaranteed and The Off Hours and Eden and Lynn’s [Shelton] movies, and were aware of what the Seattle crews were capable of, so it actually wasn’t very difficult to convince them. H2N: Factoring all that into the equation, it’s still a big decision, especially when you’ve been working on something that long, so I think it’s a testament to them that they were able to swallow their NYC dreams and embrace this opportunity. H2N: Those movies are romps! MG: I think Lucky Them is closer to who I am as a person, it’s just more my personality. But they didn’t have any proof of that except for Colin Trevorrow saying, “Trust me, I think she can pull it off.” And they went with it. I also got surrounded by a lot of people who’d done comedy before so that didn’t hurt. H2N: Speaking of Lucky Them, which is why we’re “really” here right now. Did you have time to rehearse? You’re working with such seasoned pros that I wonder if you merely had some conversations to get on the same page before shooting? How did the process go for this film in particular with regard to directing actors and capturing a tone, because it isn’t an outright Comedy; it’s naturalistic and lived-in at the same time? MG: It was pretty conversational. 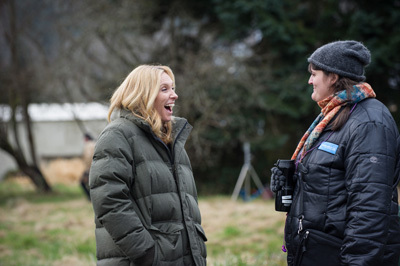 We ran some scenes in prep and we did a table read, but for the most part Toni [Collette] and I and Emily would sit around a table and talk about Ellie’s character, and then when Tom came it was talking about who they are and what they wear and all that stuff you do with actors. I’ve never really had the luxury of rehearsal time with actors with any film that I’ve done, and I’ve come to enjoy the process without it. You just have a lot of conversations on the phone or when they get to town about who the people are. You’re not running scenes or anything but when you get to set and do the blocking rehearsal and questions come up, you can address them there. I don’t think we had anything that would be considered traditional rehearsal time. Oliver Platt and I and Emily went through every scene of his line-by-line before we started shooting, because he’s very meticulous that way. We also only had two days with him so we wanted to make sure we capitalized on that. H2N: Without jinxing things, you’ve gone from drama to comedy and now it’s lining up that you’re heading in a different direction. MG: I like the idea of not being pigeonholed. There’s definitely a through-line of “character based drama” in all of the movies—Off Hours is pretty straight drama and then Eden is drama-thriller and Lucky Them is drama-comedy—and the one that I think will be next is a psychological thriller, and that one I’m sure will have some drama in there too, why not? [H2N laughs] I like the idea of trying to expand and work different muscles and try different genres and not stick to one category for too long. H2N: Are you receiving any sort of blowback? Historically, in the studio-agent system, and in my admittedly limited experience, it seems that it’s looked at as weird to want to hop around, when the reality is that as a creative person if you’ve just done something it’s so much more intriguing and exciting to swim over to another island. Are you simply surrounding yourself with people who support the idea of not sticking to one genre? MG: I think there definitely is a double-edged sword there, because I look at other filmmakers who work in one genre and get really good at it, and they’ve developed a following based on that. Someone like Rian Johnson. He’s developed a following of people who like what he does, and it’s not like his movies are all the same but they’re in the same ballpark. So that’s the downside of moving around: it’s hard to develop a group of people who are interested in you as a director because it’s not the same audience for every movie. The nice thing about having a few different sample pieces is because I’m interested in various things, I now have different samples to send out for different projects. Steven Soderbergh is a great example of someone who has been able to hop genres but he’s definitely an exception to the rule. H2N: Usually when I do these conversations it devolves into sorrow and hopelessness about there are too many options out there for viewers and it’s impossible to find audiences for our comparatively small movies. Can you give me a positive, optimistic take on the impending release? MG: Alright. I feel good about this movie’s chances… if people are aware of it. It’s an easy one to go see, because it’s pretty light and fun and it’s about music and it’s got people in it that are enjoyable to watch like Toni Collette and Thomas Haden Church and Johnny Depp. Right now, I feel like the tide is going in a good direction and I’m hoping that a lot of people come out to see it—especially in New York, because those opening weekend numbers are so critical, as you know, and basically the entirety of your theatrical future depends on that weekend. I’m doing everything I can to push that opening weekend in New York, and then following weekend in LA, to show that this movie can be popular and that people will want to go see it. H2N: Okay, that’s optimistic enough for me. You didn’t make me cry, at least.